Our hearts have been made for you, O God, and they shall never rest until they rest in you. 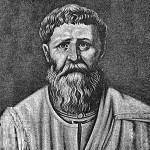 Comments on: "Augustine of Hippo Quotes: Our hearts have been made for you, O God, and they shall never..."
Understanding is the reward of faith. Therefore, seek not to understand that you may believe, but believe that you may understand. His knowledge is not like ours, which has three tenses: present, past, and future. God’s knowledge has no change or variation.